We've all seen what augmented reality (AR) can do with Microsoft's Hololens and, more recently, Pokémon Go. While Microsoft's AR vision is impressive, the company is currently charging developers $3,000 for a headset just to test it out. It better watch out, because AR startup Magic Leap may beat it to the punch as the company is readying its first consumer product for mixed reality. Magic Leap CEO Rony Abovitz, revealed at the Brainstorm Tech conference that the company is reading its production line in Florida, as reported by Fortune. The company is secretive about its technology, only releasing short videos, like this awesome clip of Star Wars droids taking over a living room, of what it's working on. But Abovitz revealed a little bit more about how Magic Leap's technology will work, saying, "Our system basically replicates how your eyes and brain work, how our neuro-visual system is designed to work, and it turns your brain into this kind of display. So the idea is not to have a display that you look at, but to use the display that nature gave us and talk directly to it." Magic Leap currently has over 600 employees, and they're busy working to bring products to light. Abovitz claimed his company's technology isn't "a decade out" - rather, we should see just what kind of software and hardware Magic Leap has cooking "soon-ish." We still have no idea what Magic Leap's mixed reality consumer product will look like, other than what we've seen in this design patent. What separates Magic Leap from the competition is that it produces the the hardware, software, chips and sensors. This control over every aspect of the product may mean a more seamless experience than its competitors. "I give Google a huge amount of credit for jumping in, but we're doing things that are fundamentally different," said Abovitz. He declined to go into specifics about the hardware. 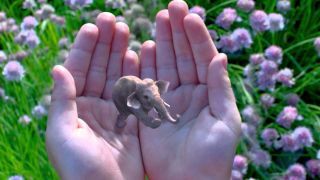 Magic Leap's initial plans for its technology are for entertainment and games, though it's also looking at applications for business and commerce as well. Imagine trying out clothes virtually using AR. Clothing store Uniqlo already features virtual dressing rooms with its in-store Magic Mirror display, but Magic Leap's AR could let users try out clothes at home. The company will also be able to beam advertisements directly to users. "So my system could recognize that I'm looking at your sweater, and then an alert pops up from Amazon or Alibaba, and it says if you buy it now you can get 10% off," said Magic Leap Chief Marketing Officer Brian Wallace. Get ready for a future that looks eerily similar to Minority Report.